A billionaire New York City art dealer is refusing to return a famous $25 million painting that was stolen from a renowned Jewish art dealer by the Nazis during World War II, a sensational lawsuit charges. 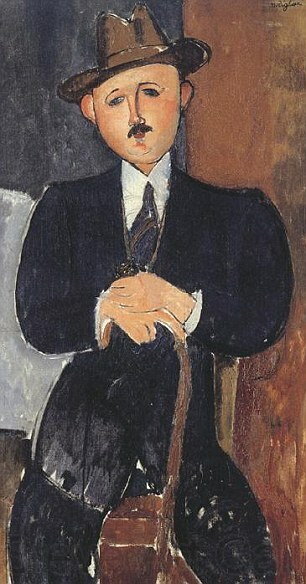 In court papers, Philippe Maestracci alleges that the Helly Nahmad Gallery -- located in Manhattan’s posh Carlyle Hotel on Madison Avenue -- is wrongly in possession of the 1918 painting, 'Seated Man With a Cane,’ by Italian artist Amedeo Modigliani. The canvas was owned by Maestracci’s grandfather, Oscar Stettiner,a prominent Jewish gallery owner in Paris. But Stettiner was forced to flee with his wife and two children months before the German troops stormed into Paris and the north and west of France became occupied Nazi territory. 'Adolf Hitler, a failed artist himself, then began the most notorious art looting raid in the history of the world', Raymond Dowd, the lawyer for Maestracci, told MailOnline. 'The Nazis feverishly pursued an agenda of destroying, confiscating or selling abroad art they considered ‘Jewish,’ ‘degenerate’ or ‘modern'. In 1944, the Nazis sold the Modigliani painting at an auction, with Stettiner, now living in the unoccupied French region of Dordogne, powerless to stop it. When the war ended, all sales of art stolen by the Nazis were declared null and void’ under international law. But the Stettiners found it impossible to track and recover the pilfered art because it had been inaccurately labelled, according to the law suit filed in U.S. District Court in Manhattan. As family members died out, Maestracci - the son of Stettiner’s daughter Maud Stettiner - became the sole heir to his grandfather’s estate. Mr Dowd of the law firm Dunnington, Bartholow and Miller said Maestracci made repeated requests to Nahmad to return the painting, but received no replies. 'They didn’t answer despite us writing to them repeatedly’, he said. 'The artwork, valued between $18 million and $25 million, apparently failed to sell in 2008. 'At this point, Philippe just wants to get this painting back into the family’. The lawsuit alleges that the 1944 sale as orchestrated by the Nazis is 'void since it occurred without the owner's consent in violation of international law and New York's law and public policy not to recognise forced sales under the Nazi regime'. It asks for the return of the painting or its 'fair market value’. 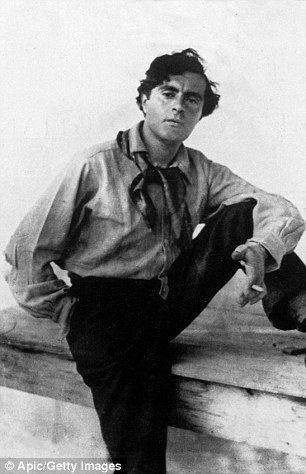 Modigliani, an Italian-born Jew who worked mainly in France, was known for his unique portraits and nudes. In 1920, he died nearly penniless at the age of 35, a victim of tuberculosis complicated by excessive drinking and drug use. A receptionist at Nahmad’s gallery she had 'no information’ about the lawsuit and referred inquiries to gallery lawyer Richard Golub who did not respond. The Helly Nahmad Gallery is no stranger to headlines. It made news last June when police say a thief swiped a 1917 ink-on-linen drawing by noted Cubism-movement artist Fernand Leger. It was reportedly worth $350,000. Police later arrested 'a habitual thief'. And last year, Helly Nahmad himself caused a stir when he was photographed at the Vogue 90th anniversary party in Paris kissing supermodel Gisele Bundchen. He explained that he and the model who is married to New England Patriots quarterback Tom Brady were longtime friends. 'Gosh, it was a kiss on the cheek’, the gallery owner who once dated supermodel Ana Beatriz Barros, told Brazilian newspaper O Dia. He claimed that the photographer had snapped the pair at a misleading angle. 'Seated Man With a Cane,’ by Italian artist Amedeo Modigliani was painted in 1918. The canvas was originally owned by Philippe Maestracci’s grandfather, Oscar Stettiner. In 1944, the Nazis sold the Modigliani painting at an auctionIn 2008, Philippe Maestracci discovered that art dealer Helly Nahmad son of art czar David Nahmad had the painting and planned to sell it through Sotheby’s auction house. Maestracci made repeated requests to HellyvNahmad to return the painting, but claims he received no replies. 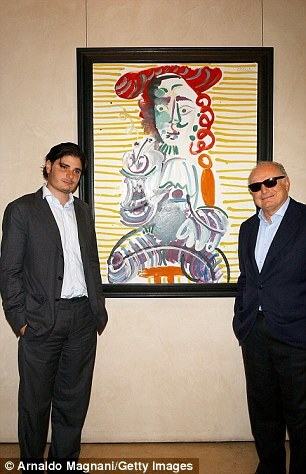 The artwork, which is valued between $18 million and $25 million, apparently failed to sell in 2008. The lawsuit alleges that the 1944 sale by the Nazis is 'void since it occurred without the owner's consent. The sale has been deemed in violation of international law and New York's law and public policy, which does not recognise forced sales under the Nazi regime'. A receptionist at Nahmad’s gallery she had 'no information’ about the lawsuit and referred inquiries to the gallery lawyer Richard Golub who did not respond.